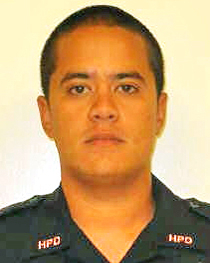 The Kona Crime Prevention Committee recognized Officer Justin Gaspar as “Officer of the Month” for July in a luncheon ceremony Wednesday (July 3) at Huggo’s restaurant in Kailua-Kona. Gaspar was honored for a traffic stop that led to arrests for multiple felony offenses. 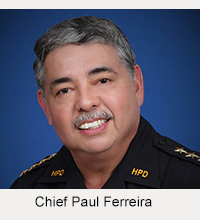 On May 4, Gaspar was assisting another officer with a traffic stop near Honokōhau Road when he observed drug paraphernalia associated with crystal methamphetamine inside the vehicle. After the two women occupants were arrested, a man in another car approached the scene and stopped. Officer Gaspar recognized him as someone with three outstanding bench warrants for his arrest and ordered him to stop and get out of the vehicle. The man reversed the car and sped away and then placed the car into drive and began speeding toward the officers, causing them to jump out of the way to avoid being hit. Other officers then stopped the car and arrested the driver. Detectives obtained a search warrant for the man’s car and found a glass smoking pipe and plastic packets containing crystal methamphetamine, along with a pair of brass knuckles. The man was arrested on the bench warrants as well as for two counts of reckless endangering, two counts of terroristic threatening, resisting an order to stop, driving with an expired drivers license, promoting a dangerous drug, possessing drug paraphernalia and possessing a prohibited deadly weapon. 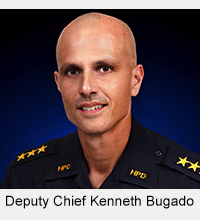 In addition to this incident, Officer Gaspar investigated 32 incidents, one traffic accident and 29 miscellaneous public complaints during May. During the same time, he made 19 adult arrests and issued 33 traffic citations.